Customer Relationship Management (or CRM) is back! What a difference a few years makes. Not too long ago, surveys were reporting that 70-75% of all CRM initiatives failed. That was yesterday. This is today. While CRM implementation results leave a lot to be desired, it is amazing what can happen when institutions go from treating CRM as an ad hoc "skunkwork" operation to treating it as a formally constructed corporate initiative. Don't say we didn't tell you so. The fact that you're at this site likely means that to CRM or not to CRM is not the question. The question is how to do it effectively? How do you create the strategy/vision, manage expectations, how do you organize around the customer, and how do you implement CRM best practices? The answer to these questions lie not only in the imagination but also in the execution of technology. For this reason, you will find plenty of tech talk on these pages. Don't shy away from these areas as these issues are well within the marketer's purview and quite frankly, the devil is in the details. Overall, within this site, we tend not to take an IT-dominant view of CRM but more of a business strategy view of CRM and fit the IT-components into the business strategy. And at other times, we bring it down to the very tactical level. "Instead of developing real relationships with our customers, we often reduced them to mere ones and zeroes... Today, the balance between art and science has teetered inexorably toward science as the true artistry we develop dwindles." Science is burying the art of customer relationships. As such we are stalling as marketers as we fail to innovate. Our industry has historically been the most innovative in the marketing realm. In this increasingly competitive environment, let us not forget our innovative heritage. After all, "scientists can explain the world, but only artists can give it meaning." 1) Content: Corporate web sites tend to be loaded with irrelevant content. They also often fail to meet Google’s Quality Score guidelines which power Google's Adwords. Consumers, on the other hand, are much more sophisticated today which means that companies need content that is interesting and relevant on all platforms, in order to make that emotional and rational connection that is necessary for engagement. Consumers want in-depth information, and they want it now. Hence marketers are creating shareable content and microsites to highlight products and promotions, but also deliver targeted messages around topics relevant to the buying stages (information at the prospect stage and offers at later stages). 2) Geo-location: This affects both the digital and offline worlds equally as we now have a physical cookie. By this we mean customers near or in brick-and-mortar stores or digital kiosks can now receive geo-located messages and offers. Retailers can now, via mobile phone signals, track customer movements around and within a store. Retailers can even identify repeat shoppers and keep a record of their in store behavior. WIth beacon technology, it is now possible to push messages to consumers when retailers think they are relevant to consumers. Not too far off will be the day when a retailer can push offers based upon knowing a consumer's prior location e.g. consumer just near the beach, on their way back to their hotel could receive a push offer for swim wear that the consumer could purchase as they passed the retailer's store or digital kiosk, or they could purchase it from the comfort of their hotel room. This technology, while still in its infancy, is rapidly being adopted by retailers and is going to fundamentally change the way retailers think of their customers. Data analytics just rose to a new level. 3) Service & Customer Experience: We are rapidly running towards a day when “100 percent of shoppers will be connected 100 percent of the time.”(Deloitte Digital). This will have a profound affect on the customer experience. Google now talks about the customer's life being divided into micro moments. Businesses need to now preside at all touch points of this new customer journey. According to McKinsey, seventy percent of a customer’s buying experience is based on how the customer feels they are treated. Today, customers have more choices than ever and are more frugal. This affords them the luxury of demanding more. Key to satisfying this empowered customer is offering a holistic experience across all company touch points and developing the infrastructure that allows for knowledge sharing and smart communication. Smart organizations will streamline, hide, or eliminate the transactional parts of the customer experience. The Apple Store customer experience is designed so that registers and receipts are effectively nonexistent. That's because they don’t add to the customer experience, they just get in the way. Given that customer loyalty is directly correlated to the customer's brand experience, having authentic personal interactions both before and after a purchase has been made will be the number one priority of all customer-facing companies. Tactics like content creation, loyalty programs and gamification will continue to play an integral role in the customer experience development, but so will initiatives that enable a holistic experience e.g. Uber which allows customers to hail, track and pay for a taxi via its web site and/or mobile app. Retailers, that in the past have tended to tie their loyalty programs to a private label or general purpose credit card, will begin to experiment with multi-tender loyalty programs (think American Express' Plenti). As a result of the Great Recession and legal requirements, the cold hard truth is that two-thirds of adults under age 30 currently have no credit cards at all. Retailers wanting to capture the Millennial market will have to become more inventive in order to capture this shopper. Using cash or debit will no longer preclude consumers from participating in a retailer's loyalty program efforts. Just ask Walmart’s Savings Catcher app or Target's Cartwheel app (discount loyalty programs). 4) Personalization and customization: In order to be effective in this new year, companies will seek to know more about its customers and use that insight to talk, engage and interact with their customers more often and more meaningfully in new and innovative ways (including mobile, dynamic content, apps, blogs, social). Static web sites are no longer enough, they need to be social, inspirational, and personal. Given the unique nature of mobile (a single phone number), Marketers can now learn customer habits and offer more proactive services, such as personal assistants to provide curated guidance in store, custom menus in restaurants that exclude foods you clearly don’t like, or have allergies to. WIth Google Now, Marketers now have access to a tool that learns from your phone and tablet activity to make intelligent choices based on ones you have already made. Companies like Hoxton Analytics are allowing retailers to determine shopper demographics by scanning and identifying customer shoe choices - all in an effort to better understand customers and traffic patterns. Retailers have begun outfitting their fitting rooms with eBay's "smart" fitting rooms, complete with touch-screen mirrors, motion-sensors, and tracking abilities to monitor what items customers bring into the room but don't buy. One e-commerce company, Stantt, scanned the bodies of 2,000 men and used the resulting data to come up with 75 different shirt sizes, all slightly different. Companies are also using their loyalty program and their house lists to send very targeted offers to customers, effectively hiding pricing from their competitors. Like it or not, 2019 is going to be up close and personal. 5) Omnichannel: Omnichannel is critical today as many brick-and-mortar stores are experiencing negative or anemic year-over-year retail sales growth; but the online component of omnichannel continues to do well as consumers slowly alter the balance of their purchase behavior - shifting more online. Those companies that understand that the brand’s offline dynamism needs to be recreated online - that sense of discovery, inspiration and entertainment - will be the companies that survive and prosper. Who says that e-commerce sites can’t intermingle presentation, curation and yes, personality? This is the year that the customer's mobile and digital experiences will evolve and rival the customer's offline experience - hopefully with some fun and humor mixed in. The idea of " first screen" and " second screen" is no longer relevant to marketers as consumers never had a device by device mind set. Screens have blended together. Consumers want a seamless and consistent experience, digitally and offline. It is now incumbent upon marketing to guide a holistic marketing strategy and customer experience. Mobile is mainstream now, and will continue to grow and dominate. Marketers now need to put mobile at the center of the omnichannel journey. Driven by Facebook, we'll see more on-demand services brought to Messenger platforms. Social is mobile. As mobile apps are the primary way people access social media. Start consideration with mobile and evolve the design up to larger screens, implementing strategies that touch the consumer's browsing and buying journey. This includes arming the floor sales force with mobile technology to check inventory, place orders or make a sale. Leaders in the omnichannel area include American Eagle, Sears, lululemon, and Selfridges. So what is CRM? Simply put, CRM is putting your customer at the heart of your business. Today it is more important than ever to build better relationships with your customers as, in this day and age of social media, they now talk to 130+ people at a time. They have a megaphone, making it easier for positive and negative messages to spread fast and wide. With the support of technology, the goal of CRM is to have a 360-degree view of the customer which will enable you to improve the quality and satisfaction of each customer interaction and maximize the profitability of your customer relationships... a win/win for both you and your customers. Depending on how you look at it, CRM can be practiced in companies at different levels. It can be practiced at the organizational level (ideally). It can be practiced at a customer facing level - anything that has to do with interactions with customers, marketing, sales and service. Or It can be practiced at the very functional level, like in a call center within a sales force, etc. While we can look at CRM on many different levels, our definition of CRM is at a strategic level i.e. an organizational level. CRM is similar to customer loyalty and relationship marketing in that the goal is to move your customer from a transactional interaction to an emotional relationship. The two components most often missing from loyalty and relationship marketing being: a) technology and b) the management of relationships with other members of the business network: affiliates, branches, employees etc. - i.e. recognizing your customer as a customer through any channel. The term CRM, arguably, was first put into the public domain around 1993, when Tom Siebel came up with it. So it is closely connected to Siebel Systems - an IT company. Hence the problem. Many executives are under the misconception that CRM is principally an IT implementation... which explains many of its failures -- and there have been many of them. If technology is applied to a faulty business strategy, all that is going to happen is that the company is going to become more efficient at doing the wrong things. If the core business strategy isn't put right first, you'll have failure. As we view CRM more as a strategy than a process... get the business strategy right first. Decide which customers or segments to target. Develop sensible customer acquisition, retention and development plans. Sort out the channel strategy first (direct or indirect) then sort out which products, services, bundles of value to offer the chosen customers. Once that's in position, then start looking for IT to support it -- but not until then. We spoke earlier about putting your customer at the heart of your business. Part of that process involves developing a "relationship" with your customer. How your customers define that relationship will vary. As the CRM marketer, it is up to you to find out what's important to that customer. At the end of the day, you want to be able to answer the question: "What’s the “one thing” that is distinctive about my customer relationships? As we are in a business of one sort or another, our goal as marketers, is to have CRM help us acquire, grow and retain profitable customer relationships to create a sustainable competitive advantage. Without a doubt, customer loyalty is a key driver of profitability. Creating customer loyalty must be an integral part of your organization's strategy - particularly in a time of industry consolidation. Understanding customers' requirements is fundamental to business success. "It's incredibly arrogant for a company to believe it can deliver the same sort of product that its rivals do and actually do better for very long. That's especially true today, when the flow of information and capital is incredibly fast." 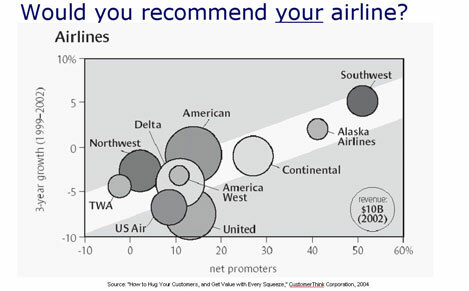 How does our business define customer loyalty? Are our customers loyal? To what extent or intensity? How do we create, build or earn customer loyalty? How can we use customer loyalty strategically and tactically for positioning? The first step in answering these questions is to measure both customer satisfaction and customer loyalty. 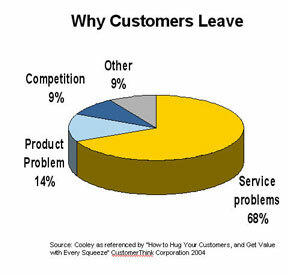 In working toward a thorough understanding of your customer, begin by looking at why your customers leave. Profitable CRM projects start by understanding customer needs. "If growth is what you're after, you won't learn much from complex measurements of customer satisfaction or retention. You simply need to know what your customers tell their friends about you." Consider the checklist below. We believe that these strategies will enhance your likelihood of long-term CRM success. 1: Get sponsorship from the top brass. If management doesn't believe in the new approach, why should the employees? Implementing CRM requires working across organizational boundaries and breaking down long-term siloed behaviors and attitudes. You can't do that by yourself! Many times the difference between a successful CRM strategy and a huge waste of money is backing from the executive suite. 2: Build a team. Prior to developing your CRM strategy or selecting your CRM software, form a CRM team with representatives from each department to make sure colleagues' needs and concerns are addressed. Too often companies neglect to include the correct stakeholders, and the initiative fails to meet the needs of those tied to its results. Pick your CRM team wisely - everyone will need to own the customer experience. Remember in forming the team, consider people, process, and technology as all will be affected. 3: Define your business objectives? Your CRM strategy must be designed with your business objectives and customer requirements in mind. 4: Identify who your customer is. Is there agreement on definition of "customer?" - The marketing department of an automobile company might consider a "customer" to be a dealer, but the call center might consider it to be a driver. Have consensus on this and other key definitions. 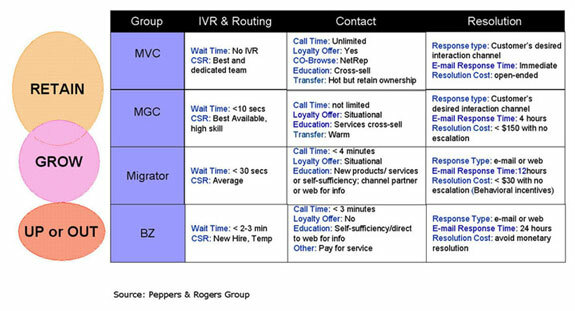 Can you identify your customers across multiple touch points (retail, call center, mail, catalog, web and e-mail)? Consider life stages. According to the U.S. Census Bureau, there are roughly 75 million baby boomers (born between 1946 and 1964), more than 49 million gen Xers (born between 1965 and 1979), more than 72 million gen Yers (born between 1980 and 1999), and 40 million millennials (born between 2000 and now). 5: Differentiate. Identify your customer segments - your high-value and high potential customers. Know who you want to serve. Understand what that customer wants? Prioritize. 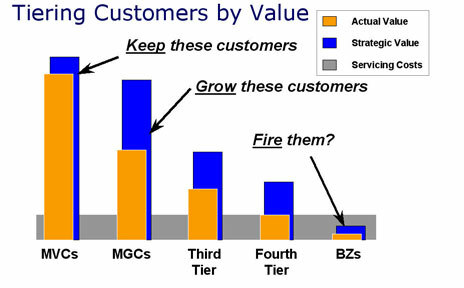 What is the customer worth and what is their potential worth? 6: Understand your Customers - what they want, and how they want it from you. 7: Agree on desired customer behaviors - build consensus on how you want customers to behave differently and what the customer experience will be... from the customer's perspective. Design a different customer experience for each customer segment. 8: Define customer experience goals. Articulate the customer experience. How should your experience feel? Identify important business interactions e.g. high volume or high cost. Identify interactions that are important to the customer - high involvement and high perceived importance. Evaluate performance: How are these interactions currently handled by your company? Are there opportunities for improvement? Focus on hot spots: Identify the areas that require your greatest focus and will provide the greatest potential return. Many companies don't have a good connection with customers. That's why firms should consider developing a systematic approach for incorporating the needs of customers into the design of customer experiences - ideally led by a senior officer who will act as the voice of the customer. The key to developing a successful new customer experience is to develop a response to a customer need that is unique, compelling, and adoptable. A response so attractive that customers are willing to change long-standing, often deeply ingrained behavior. 9: Have an integrated customer strategy. Today interactive marketing is a fragmented discipline in which marketers work with many different vendors to develop and execute marketing programs. Recognize that disparate databases of customer information prevent companies from gaining a holistic view of the customer throughout the organization. Break down those silos. Line of business managers are often employing tactics that address products and not customers. That is because they are still looking at accounts on file, rather than at customer relationships e.g. banks that send two offers within a short time span - one that recommends consolidating their debt into a home equity loan and the other that offers a balance transfer for their credit card. 10: Define and map data requirements - You'll need to know what customer data is necessary and from what system it will originate. See your customer through the same lens. A firm understanding of the level of customer data - account or household level - is critical. Do you plan to append external data? If so, what types: household size, income, psychographics, ZIP, real estate information etc. 11: Standardize data. Various departments in your organization may see your customer quite differently from another. Using one integrated set of analytical data throughout the company can help executives to make key decisions about how much to invest in a particular customer. Keep your promises. Remind customers of promises kept and take responsibility for promises unfulfilled. Respond quickly to customer queries. Whether they send an email or leave a message, or come to the service counter, customers' time is precious. 13: Get personal. Customers hate to feel like the sales agent is reading to them from a script. Learn your customers' personal needs and profiles and target your service to each individual. It will make them feel important and that you value the relationship. In order to do this effectively, you need to staff and empower your talent pool appropriately to deliver on the customer experience. To do this effectively, focus on people, process and tools. 14: Develop success metrics - How will you know if your CRM program has been a success? 15: Create customer engagement programs (acquisition, growth and retention). Customer engagement is a process, not an event. Too often retention is treated as a project, rather than a guiding principle. 16: Collect Data - collect and use information from each customer interaction to make your chosen customers more valuable to your enterprise. Can you identify behaviors, attitudes, needs, propensities or intentions? Plan to clean your data regularly. 17: Test, test, test. Troubleshoot with test customers before making your services generally available. Focus on ROI. Experiment with your Marketing. 18: Monitor the customer experience. Keep your eye on the prize. Measure the results and soothe the inevitable hiccups. Walk a mile in your customers' shoes. Don't rely on complaints from customers about how horrific it is to do business with you. Put yourself in their shoes by going through the typical customer experience. It is amazing how many companies institute processes and half heartedly mystery shop themselves. Once you suffer through what you dish out, you'll be shocked into a more customer-centric mindset. Guaranteed. 19: Automate processes. Having customers enter their personal information on a Web site versus providing it to an agent over the phone reduces the potential for human error. Also, customers may feel uncomfortable revealing personal data like medical and financial information to another person. 20: Empower staff. Give front line staff the ability to please the customer. Too often they can't make timely decisions nor can they present relevant offers - effectively facilitating customer dissatisfaction and defection. 21: When buying any new CRM system, keep it simple. Don't buy what you don't need. The fewer bells and whistles, the less time and money you'll need to devote to training. People don't like change as it is; keeping things simple only makes the switchover that much easier. And train early and train often. 22: Communicate your successes to the rest of the organization. Identify quick wins. Tackle the smallest, easiest task straight away and save the hard stuff for later. Success early on gets the ball rolling and motivates employees. Success can be contagious. Too often, relationship programs are set up with the arrogant assumption that consumers should be happy in a relationship where they just sit around and receive marketing messages. This is a mistake. There needs to be a feeling of reciprocity by both parties (not to be confused with economic parity). At the end of the day, you will want both the customer and the business to perceive that they are getting more from the relationship than they are contributing. While the company is most likely defining its benefits and costs in purely monetary terms. The customer is more likely to be weighing more intangible aspects of the interaction. In any event, there is satisfaction in both camps and the relationship is likely to go on. A win-win situation.